A few more Sandhill Cranes come in for their typical smooth landing. It’s snack time. Did you ever get the feeling that you may have been missing out on something? There is a special time of year on the prairies that is quickly becoming my favourite – sandhill season. It starts with the first sighting of Sandhill Cranes in summer and lasts until I can’t find them anymore in fall. It is just a matter of time before it will be on official calendars. Each year they seem to congregate in different stubble fields south of our city. This fall I saw them every few kilometers on some roads. What a beautiful and familiar sight. But it wasn’t always so. Just hanging out in a field. These guys are groupies. Years ago there no sandhills around here. I remember the first time I saw one, I had no idea what it was. I took a photo and showed it to a hunter who identified this strangely appealing creature. Take a nice piece of meat and a cedar board and place them together in the oven. When they are finished cooking, throw away the meat and eat the wood because it’s not as tough. At least he was helpful with the identifying information! After that conversation, I began to keep an eye out for these birds. They had me hooked from the beginning with their large size, beautiful wing colourings and gracefully-awkward movements on land. I started seeing a lot of them. One day as I was looking from a distance, I noticed that it was hard to tell geese and Sandhill Cranes apart. They often end up in the same fields. Suddenly a light went on. It’s entirely possible that for many years I had glanced out at fields, assumed that I was looking at geese and missed out on the Sandhill Cranes entirely. Yikes. Now I wonder what else I’m missing! Flying and making their unique noise means that it’s never a quiet moment when the sandhills are around. These sandhills fly across a dark sky and when I noticed the sun lighting them up, I quickly turned to get this long-distance shot. I liked the out of focus trees as a backdrop for two sandhills heading out. That sound is quite something – I like your description of it. I’m glad your husband liked the instructions – I certainly enjoyed the story when it was told to me. I’m not familiar with him – I’ll have to look him up. He’s got a very dry sense of humour and tells outdoor tales in a way no one else can. Funny guy. Gorgeous shots Lyle! I love that first one with them flying and walking – beautiful. Thanks. That’s such a familiar and welcome scene as they come into join the other sandhills. I think every year I enjoy them more. Super photos of these amazing birds I have never seen in person. I particularly like the fourth one down (the lighting really is special) and of course the final solo shot. Absolutely outstanding! It’s hard to beat good lighting and close flights. Glad you enjoyed them. Great photos! We have three Sandhill Cranes in our backyard (the golf course! ), and I love taking photos of them!! And listening to their “honking” sounds!! Our three really seem to love being photographed! I try to get my camera ready for when they take flight, but, alas, I need to get faster for that!! That golf course of yours is sounding more like a wildlife preserve. What fun to have them so close and it sounds like they are a lot less shy than the ones around here. Your flight shots will come. Great set Lyle! Really like the background color of the field as the Sandhill Cranes come in for a landing. Thanks. I have an unproven theory that the Sandhill Cranes tend to gravitate toward the fields which have been more recently combined. That makes for a much brighter yellow in the background. I guess you know that I am also a big fan of Sandhill cranes. I want to go to Nebraska one of these years in March to see them by the thousands – wouldn’t that be cool? Your photos really do them justice. I think those Sandhill Cranes have a few more fans than us. It really would be cool to see thousands of them – and noisy! I appreciate the comments. Thanks so much, I always appreciate your comments. I have had some comments from people in Saskatchewan that they haven’t seen them either so I’m not sure where their migration routes all take them. We also found them in Yellowstone earlier this year. I have had a similar experience only for me it was swans mixed in with snow geese on a large puddle a couple of miles from my house. Sadly my aha! moment came without camera in hand. Nice work on the photos I can appreciate the last photo the most…. Not a bird to stick around for a close up. It’s funny you should mention swans because I’ve also noticed them the last couple of years as well. Too bad about the camera not being there. I was a bit surprised on the last one since you’re absolutely right about them keeping their distance – the saving grace is that they are so large it helps to reduce that impact. I love these birds even if I never saw one for real. All photos are nice, but I particularly love the first photo and the last one! They are an easy bird to love even from a distance! I appreciate your comments. Isn’t it amazing that you can not see something until it is pointed out to you and then it is everywhere. I find that especially with trees. For years I didn’t know what a wilga tree was and now I am finding them all over Rocky Springs. My favourite photo was the sandhills and the dark sky. Thanks once again for a lovely post. It’s even true for things like vehicles – start getting interested in a model and you see them everywhere. I think our brains can only have so many focus priorities and then everything else washes into the blur. Cooking with a rock eh? That definitely ups the ante. I always appreciate getting the Australian perspective. Utterly great shots (as usual). I have had a longing to see the Sandhill Cranes ever since reading “Even Cowgirls Get the Blues” by Tom Robbins… many decades ago. I don’t remember the plot, but somehow associate it with these marvelous winged creatures. Perhaps someday? Thanks. Sounds like sandhills are on your photo bucket list. I think part of why I like them so much is that they are only here for a few weeks each year so there is a bit of a novelty factor. Geese are around much longer and of course they don’t as good. Lucky you, Lyle. I’ve never seen a Sandhill Crane much less photographed one. Nice images of this cool bird. I appreciate that. It’s interesting that each region has wildlife but they differ in the kinds of creatures. It really is a cool bird. 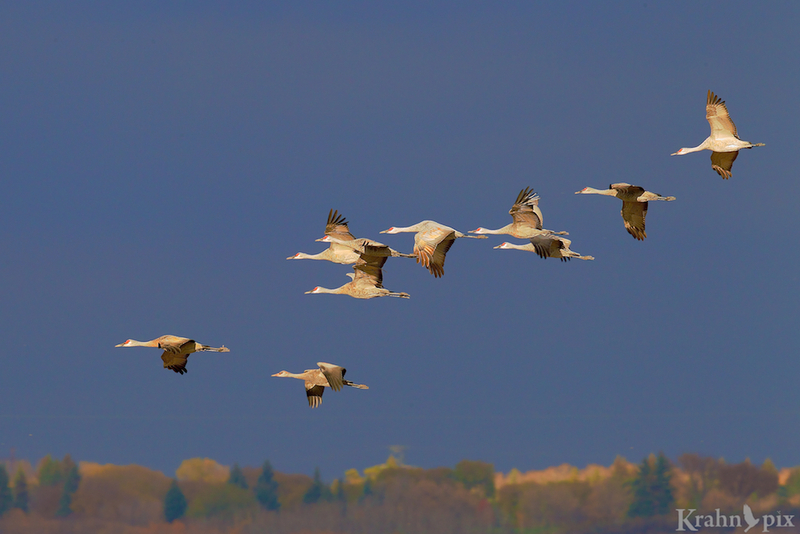 What gorgeous, gorgeous photos, Lyle, especially the one of the cranes in flight against the dark sky. As far as I know, I have never seen sand hill cranes, but they come to a place in the Central Valley of California annually, and people come from all over to see them. I think I’m missing out on something! Thanks so much. That dark sky scene was one of those surreal moments. You are definitely missing out on watching these unusual creatures. They are worth a visit. I’ve never seen this bird before. Looks cool 😀 Great shots! Thanks. It’s a fun, quirky one that I find most enjoyable. Great shots! I have only ever seen a few together at one time so would love to see them in big flocks one day. Thanks. It’s interesting that you’ve only seen a few together. I am so used to seeing them in large numbers here in Saskatchewan that it was odd to see only one or two of them in Yellowstone. I’m happy someone else gets to share their presence. Their distinctive call is something I look forward to each year. Here’s hoping you get a better image than mine. Thanks for the comments. What a cool-looking bird (which we don’t have where I live). I really like the group shots, but none of them quite match that stunning final shot which highlights the unique beauty of the bird. Thanks for passing on the hunter’s recipe–I think that I will be sticking with the more traditional turkey for the US Thanksgiving Day tomorrow. As you often do, you challenge us with your final statement about our need to look more closely at our surroundings. I have become quite a fan of the Sandhill Cranes. Not only do they look good but their unusual mannerisms on land and incredible ability to soar in the air is captivating. Have a great Thanksgiving with your turkey cooked the right way. I appreciate that. It was a lot of fun to capture them.